Every phone ships with a built-in panoramic photo mode, and most phones also have a time-lapse feature — if not, there are certainly dozens of apps that do time-lapse photography. 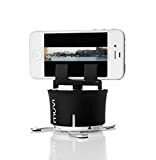 No matter what phone or app you’re using though, you’ll never create time-lapses or panoramic shots as stunning as the Veho MUVI X-Lapse 360-Degree Photography and Timelapse Accessory. This brilliant little gadget is compatible with any phone you have, and it rotates over time as your phone captures a photo. The result is a 100% perfect time-lapse or panoramic photo each and every time. The X-Lapse is on sale right now for just $9.99 with free Prime shipping, but you might have to select the lower price from the “other sellers” section in the column on the right.